Sunday's Lunar Eclipse Has Got It All : The Two-Way The total lunar eclipse, visible in the U.S. Sunday night, is the first since 1982 that's also a supermoon as well as a blood moon. 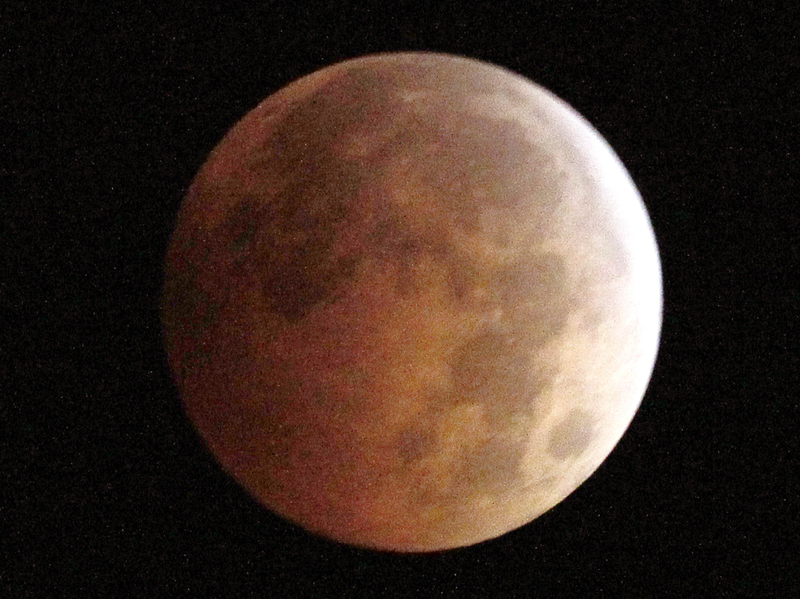 An Oct. 8, 2014, photo shows the blood moon, created by the full moon passing into the shadow of Earth during a total lunar eclipse, as seen from Monterey Park, Calif. Sky-watchers will get a chance to see another "blood moon" eclipse on Sunday. Maybe you've become inured to all the superlatives that get attached to sky-watching events. But the one on Sunday really is worth a look — it's the first total eclipse that's also a supermoon and a blood moon in more than three decades. As Space.com explains: "Supermoons occur when the moon reaches its full phase at or near the satellite's closest approach to Earth, and appears abnormally large and bright as a result. The Sept. 27 event is quite special; the last supermoon eclipse occurred in 1982, and the next won't take place until 2033." The total eclipse will also feature a blood moon, a phenomenon caused by a refraction of moonlight in the Earth's atmosphere known as Rayleigh scattering. Update at 1:55 p.m. ET: A small correction from Sky & Telescope senior editor Kelly Beatty, who sent us an email to explain: "Rayleigh scattering is what makes sunsets red, caused by our atmosphere's preferential scattering (not refraction) of blue light. That's where the redness comes from. But refraction (not Rayleigh scattering) is the reason that any light reaches the Moon during totality. So, it's really both things." You can also hear Beatty interviewed today on WBUR's Here & Now. Sunday's event is also the culmination of a "tetrad" — the last of four successive lunar eclipses that started with the April 15, 2014, eclipse, followed by one on Oct. 8, 2014, and again on April 4 of this year. As Sky & Telescope writes: "Observers in the eastern half of North America can watch every stage of the eclipse, from beginning to end of the partial phases (3 1⁄3 hours in all) during convenient hours of late twilight or darkness with the Moon mostly high in the sky. If you're in the Far West, the first partial stage of the eclipse is already in progress when the Moon rises (due east) around the time of sunset. Those in Europe and Africa see the eclipse on the local morning of the 28th." Totality (when the moon is completely in Earth's shadow) arrives at 10:11 p.m. ET for those in the country's East, or 9:11 p.m. CT for those in the Midwest. To get the exact time of the eclipse for your location, the U.S. Naval Observatory's page has a handy calculator.